Just like us dogs need activity and mental stimulation or they get bored. Boredom can sadly lead to depressed or destructive behaviours but there are many easy ways to provide environmental enrichment for your dog. Dogs are natural scavengers and if allowed to, will quite happily keep busy all day looking around for food. Problem solving to find food or toys is a very natural thing to do, so we can use this in many ways to encourage them to use their brains and keep them happy. Try some of the following activities next time you visit Dogwood. Scent games – make a toy nice and smelly, let your dog sniff it and then lay a trail by dragging it along the ground so your dog can search it out and return it to you. Hide and seek – wait until your dog is not looking at you and then hide. Call your dog and wait for him to find you, giving him lots of praise and a tasty treaty when he does. Hide and seek with toys - stuff toys with your dog’s food and hide the toys around the field. Digging pit – encourage your dog over by placing treats on top at first, next bury them just under the top layer. Continuing to give your dog a varied and enriched life helps them to be flexible and able to cope with changes in life. Constantly look for new ways to challenge your dog! All equipment is provided entirely at the user’s own risk and Dogwood Adventure Play or the landowner accept no liability in the case of injury. Always consult your vet prior to commencing any new activity. Natural features encourage dogs to interact with their surroundings and provide physical and mental challenges. Scatter some of your dog's favourite treats among the logs and watch them use their whole bodies to find their food. Cavities in the logs create hidey holes for treats, engaging the senses of smell and touch. Our Sensory Garden reduces stress and anxiety, encourages dogs to become more secure in their surroundings and provides additional stimulation and enrichment. 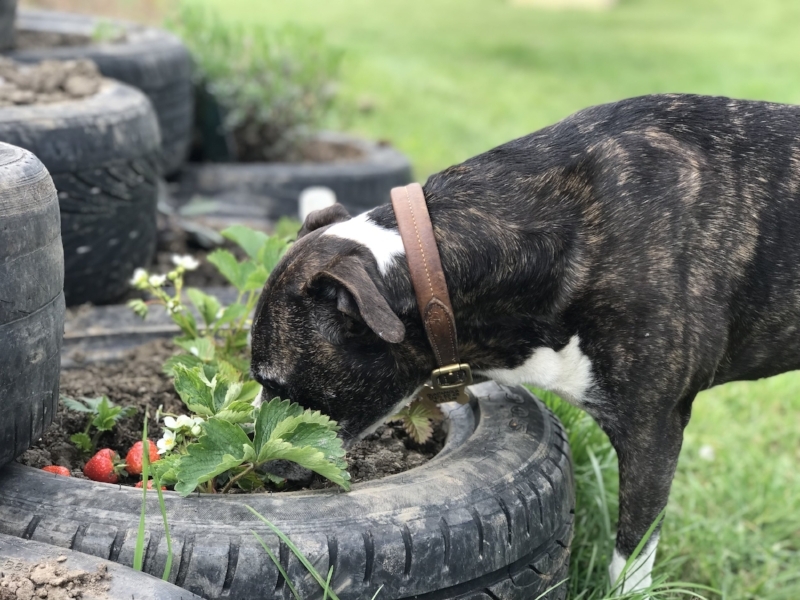 The Sensory Garden is made up of numerous different smells, textures and sounds to engage all the senses and offer enjoyment for each individual dog. Dogs love nothing more than having a sniff about and they will even self-select medicinal plants using their sense of smell and influenced by their physiological and psychological needs. They might just want to inhale a plant, or they may wish to ingest it. The tyres give dogs a nice shelf to stand on while they choose what they need. Yarrow: offered to animals with inflammation, urinary problems and internal and external wounds. Our Adventure Play dog parkour equipment introduces dogs to the world of jumping, climbing, balancing over, crawling under and going around different obstacles. Dog Parkour helps with confidence and overcoming fears. It is a low-impact but challenging activity and can be varied according to age and fitness levels. Dog Parkour was founded in the US but its popularity is spreading throughout the world. It is a non-competitive event but you and your dog can work towards titles. There are a number of Dog Parkour community Facebook groups which provide support and advice. Benefits: Increased muscular strength and proprioception, increased confidence, increased ability to work with distractions. How to train: Find a low sturdy object. Mid forearm to elbow height is a good starting point, tall enough that the dogs see it as an obstacle but not so tall that it is intimidating. Reward any paw interaction, shape the behaviour until your dog will put all four paws on the object. Don’t worry about your dog jumping at first, as the object gets taller and you approach it with more speed, your dog will make the transition from walking onto the object to jumping onto it. Gradually increase the height of the object, while always working within the comfort level of your dog. Safety: Always spot your dog, be ready to catch him or provide assistance if needed. Let your dog choose to perform the behaviour, and then reward. Lift your dog down from the wall or find an alternative route down if jumping above dog’s shoulder height. Skill: Dog jumps between two objects without touching the ground in between. How to train: Your dog should first be comfortable with the skill of jumping on an object. Now, find a low, sturdy object with another low, sturdy object very close to it (usually start with less than 1ft away, even less for small dogs). It should be tall enough that the dogs see it as an obstacle, but not so tall that it is intimidating. Encourage your dog to step between the two objects and reinforce your dog when he is on the second object. Gradually increase the gap distance, the height of the objects or the speed. At first he may simply step between the two. Don’t worry about this, as you increase the distance between the objects and the speed of approach, he will naturally begin jumping between them. Safety: Always spot your dog, be ready to catch him or provide assistance if needed. Let your dog choose to perform the behaviour, and then reward. Make sure your dog has a chance to look at the gap jump before deciding if he can do it. Allow him this time, and reinforce whatever decision he ends up making as you want your dog to make smart choices about his physical abilities. Lift your dog down from the wall or find an alternative route down if jumping above dog’s shoulder height. Over: Dog must jump over one obstacle that is taller than dog’s elbow height. Feet should not touch the object. Through: Two obstacles must be less than dog’s body length apart from each other. The dog must pass through these two obstacles with confidence. Your first step in training is to visit the International Dog Parkour Association’s rules section as that provides the most up to date safety information. Take care to ensure that you only ask your dog to do what he is physically and mentally capable of performing. Allow dogs to make the choice to perform the behaviour and then give a reward. We recommend shaping techniques (rewarding for each successive step that is closer to the final goal), but luring (with a food reward for example) can also be acceptable in some cases. Let him go at his own pace and always give him the option of not doing something. Dogs must never be picked up and placed on obstacles. Ensure that dogs are strong enough to safely perform the activities – start by visiting the vet to ensure that dogs are physically healthy and the correct weight. Always start with small versions of parkour skills practiced in a slow and controlled way with several repetitions. Even experienced dogs need to warm up properly with a few repetitions of smaller, slower, simpler behaviours prior to working on the more complicated skills. Benefits: Increased proprioception, increased balance, increased range of motion. How to train: Start with a large object that has sides just tall enough that your dog has to step over them to get into the object. Reinforce for any interaction with the object including things such as head into box, one foot in, or pawing at it. Gradually increase your criteria until your dog is getting all four feet in the object without hesitation. You can now increase the difficulty by decreasing the size of the object or increasing the height of the sides. Advanced Version: Send your dog to specific objects from a distance. This is a great way to practice directing your dog to a specific location.Find objects that move. This can be things with wheels or something that tips when the dog gets into it. Safety: This is a fairly safe exercise, but be sure to check the edges and bottom of the object to be sure they won’t scrape, cut, or otherwise injure your dog. Benefits: Increased proprioception and body awareness, improved confidence, increased ability to work with distractions, and increased core strength. Find a low, wide wall that your dog can easily get onto. Start with a wall about mid-leg height and at least twice as wide as your dog. Have your dog walk across, reward frequently. Gradually decrease the width of the wall. If needed, start with a ramp-like object. Start in a low distraction environment and treat for any paw interaction with the object. Safety: Always spot your dog, be ready to catch him or provide assistance if needed. Let your dog choose to perform the behaviour, and then reward. Be aware and prepared for the fact that some dogs (like some people!) seem to be afraid of heights and might panic and jump off unexpectedly after a certain elevation. Lift your dog down from the wall or find an alternative route down if you’re balancing above your dog’s shoulder height. Dog starts near handler, goes around an obstacle at least 3 feet away and makes at least a 180 degree turn back towards handler. Dog must demonstrate around in both directions.